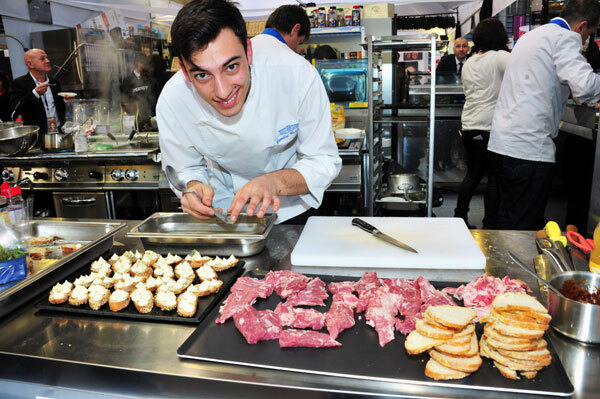 Toques Brûlées and Euro-Toques offered an amazing show at Agecotel 2016, a very hot show at an incredible pace with greatest gastronomic talent. 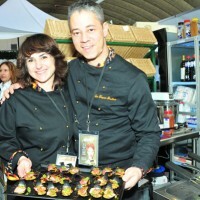 Toques Brulées made the show at the salon Agecotel, the trade show for catering and hotel industry with some members of Euro-Toques. 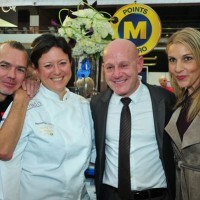 On the Metro booth, the chefs of both associations made on February 1st a very brilliant show by achieving a myriad of recipes in an atmosphere of sheer folly and sharing. 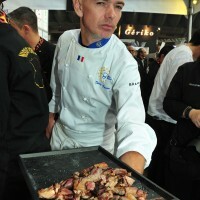 A truculent spectacle led by David Faure, the mischievous, deliciously rebellious chef from Nice. 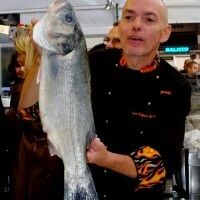 The President of Toques Brûlées, David Faure, the chef of restaurant Aphrodite in Nice, likes shaking up the gastronomy! His key words are to share, give, offer, find, move, create, evolve. 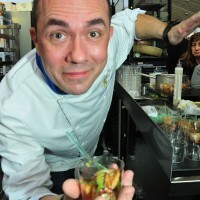 Driven by a “devouring” energy, he likes to constantly moving things and the shows by his association of generous chefs are hair-raising and joyful. 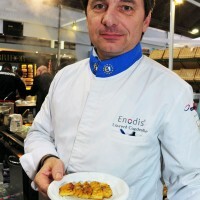 To accompany him in this dynamic and irresistible culinary ballet, he was surrounded by the Toques Brûlées chefs Noëlle Cornu-Faure, Gabriel Degenne, Redouane Mansouri, Claire Verneil, Laurence Duperthuy-Stramigioli, Dimitri Carrossa, Takayuki Kamiya and Aurélien Nourry. 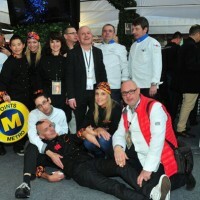 They were joined by Euro-Toques chefs (with white toques on the pictures) David Vaqué, Christophe Chiavola, Brigitte Autier, Olivier Renaud, Florent Houget and Laurent Capdeville. 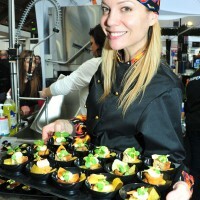 The talented chefs have rocked the public’s enchanted taste buds with the creativity and originality of their recipes. 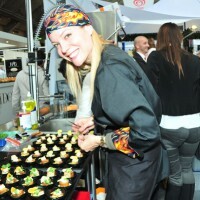 These cuisine crazy lovers, recognizable from afar with their black “toques”, fringed with orange and yellow flames, had made with the beautiful Metro products, some delicious recipes like Caramelized Pain Perdu with cream, Passion confit, Mango Leather and Vegetal Touch, made by Claire Verneil, a Crumble Confit Pineapple, Banana juice, Cardamone by Noëlle Cornu-Faure, a Pan-fried Foie Gras on a bed of Tomato, an Iberian Pork Chop with Parsley fondue and Sherry Vinegar and a Flambéed Pineapple with Balsamic Vinegar by Florent Houget, a Pineapple à la plancha, Caramel and Olive Oil (Laurent Capdeville), a Curry of Sweet Potato with Wild Seabass steak with young grilled Vegetables by Redouane Mansouri. In the end, it was a beautiful day of friendship, laughter and food energy, that the Toques Brûlées, this talented group of chefs gave us. 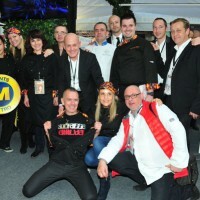 With that, we left with charged batteries for the duration of the show Agecotel and a beautiful memories of Métro Premium- the chefs’s supermarket – products represented by Edmond Lampidecchia. 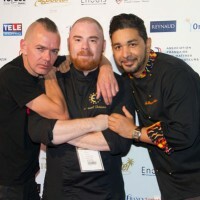 Thank you Toques Brûlées and Euro-Toques chefs! Thank you David! 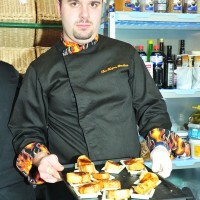 The Association Les Toques Brûlées was created in 2007 by two young chefs from Nice, David Faure and Luc Salsedo. 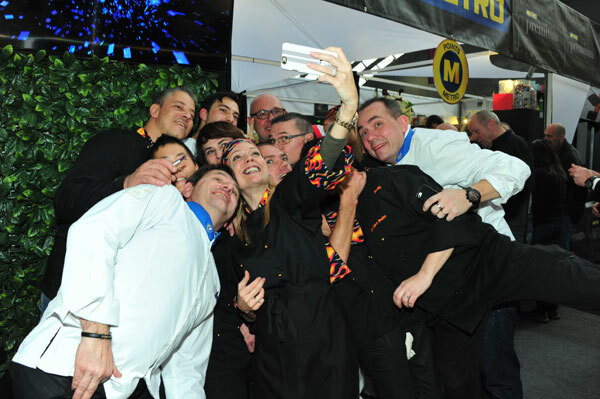 The association brings together some fifteen talented chefs with a bit crazy state of mind, from a variety of backgrounds: wine bar, brasseries, traditional, gastronomic or family tables. 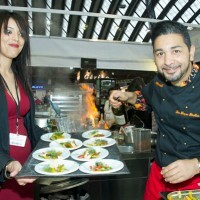 Their similarities are inventiveness, culinary passion and sharing, is and will always be sharing their talents with the public. 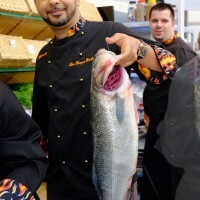 In love with their region, they perform at culinary events, displaying a real scene of show. 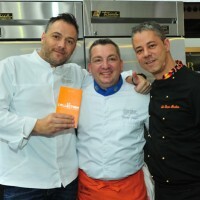 Gastronomic dynamism, modernity, creativity and conviviality are their creed. 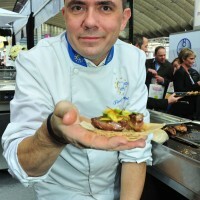 Euro-Toques, a lobby created in Brussels in 1986, aims at giving prominence to seasonal products and defend the regional artisans. 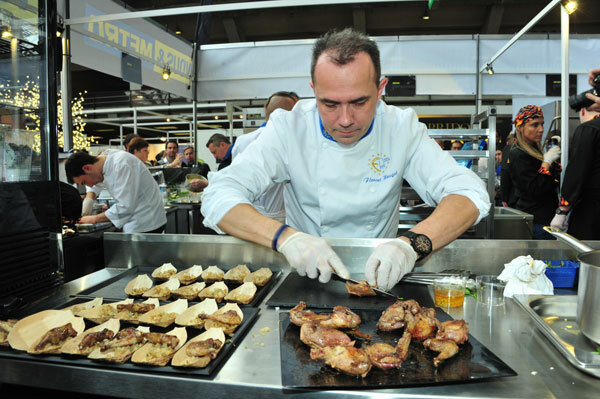 Guardians of the authenticity and specificity of the best products, 2, 000 chefs have been striving for 28 years to keep the diversity of gastronomic products.